Bearings are used in order to specify a direction relative to north. The bearing is a three-digit angle measured clockwise from the northern direction. In this example, the bearing of A from O is . The bearing of B from O is . And finally, the bearing of C from O is . Bearings can be used in conjunction to Pythagoras’ theorem in order to solve application-typed problems. A hiker travels 3km due north and then 4km due east from point A to point B.
a) What is the bearing of B from A? b) What is the bearing of A from B? c) What is the distance between A and B? Trigonometric ratios is used to calculate the angles inside the triangle. However, bearings are calculated clockwise from the northern direction. Therefore, the bearing of B from A is . The bearing of A from B is . 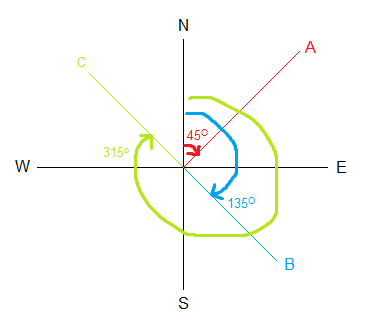 Point A is on a bearing of 233 degrees, 5km from point B. The sine and cosine rules can also be used alongside bearings in order to solve a wider variety of problems. A hiker leaves base camp (B) and travels on a bearing of 135° for 4km to find a lake (L). She then travels on a bearing of 075° for 5km to a cabin (C). b) What is the distance from B to C? c) What is the bearing of B from C? In this diagram, the black lines denote the information provided. The pink marks indicate the information (part a, b, c) requested in the problem. Since the angles in a triangle add up to 180°, the unknown angle in the blue triangle is 45°. Therefore, the angle BLC is 45+75° = 120°. With this angle, the cosine rule can be applied to find the length BC in the first triangle. To find the bearing of B from C, the sine rule could be used on the first triangle again. Thus, the base camp is on a bearing of 244° compared to the cabin, and is 7.81km away.